6 Days, 2 Mountains, Let’s go! “The mountains are calling and I must go” – This quote by John Muir I have always found powerful. As a child I spent time with my family exploring majestic peaks, now in my twenties the mountains hold a special place in my heart, they are filled with wonder and adventure. The real fun of the mountains I believe is in, the grin splitting, fist pumping, high fiving, that comes from sharing the experience with friends. To share the accomplishment of reaching the top, to be there when you fall and sit silently on the summit to take it all in is something quite special. So it is with anticipation each year my boyfriend Martyn and I plan our annual trip to the snow. 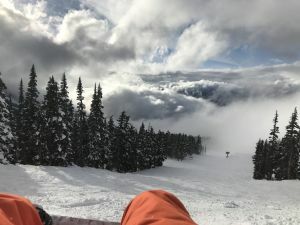 If Canada is the Mecca for adventure seekers, then Whistler is the shangri-la for snow sports, a hive of energy swirling around in a blizzard over 8,171 acres of powder and with over 200 trails. 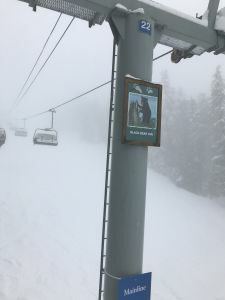 Whistler boasts the longest unsupported gondola (4.4k,) joining the Blackcomb and Whistler peaks. In an average year they have 11m of snow, making this a powder capped heaven! With a great mixture of blue, red and black runs Whistler has something for everyone. As you can imagine I was super excited to get out there and test out the slopes. Arriving late Saturday our 2 hour 30 min transfer from Vancouver to Whistler along the sea to sky road, was long! This is a stunning trip in itself following the meandering lakes. Arriving at our hotel the Fairmont Chateau a beautiful ski-in ski-out resort I knew we were in for an incredible week of luxury and snow! Jet-lag couldn’t stop us, Sunday morning we were on one of the first lifts to the top to check out what was in store on the Blackcomb side of the mountain range. The gentle flakes of snow which had been falling from the sky since we arrived made the visibility low, about 30metres which was not great, so we spent the afternoon chilling out after a few runs enjoying the outdoor swimming pool and gym. 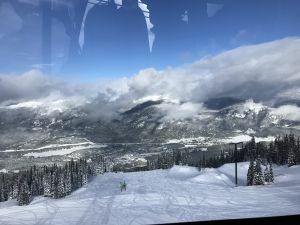 Having only snowboarded in Europe before I was excited to try somewhere new, Whistler is very different to Europe the trees are tightly packed together and the runs are vast, with large areas of off-piste. 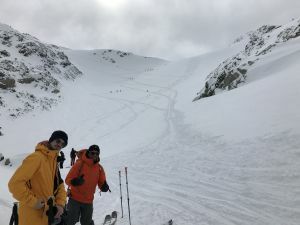 We stayed on the Blackcomb side exploring the runs and off-piste areas for the first two days, the runs were beautiful and long with some mogul sections which I was not a fan of! The queues for the gondolas and lifts could be quite long but there was so much terrain you could be the only person on a run at times which was exciting, it was like you had the whole mountain to yourself. By Tuesday evening it hadn’t stopped snowing and I was missing the sun. One of my favourite parts of snowboarding is the crystal clear skies and rays of sun creating jaw dropping views at every turn. On Wednesday we were woken to striking rays coming through the curtains. 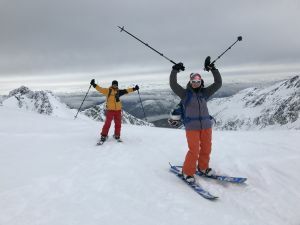 The sun makes a huge difference, the mountains peaked through the clouds showing off their tremendous tips of white fluffy snow, the added visibility is also a huge confidence boost and allows you to really get into the flow. 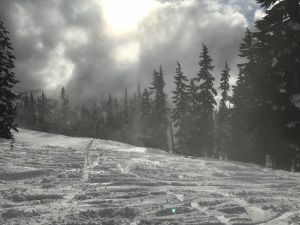 As the weather had opened up we went across on the Peak 2 Peak gondola to the Whistler mountain side and into the Symphony Ampetheatre, a huge expanse of open off-piste, where we spent time making fresh tracks and enjoying the sun on our faces. Getting tired of falling over and digging myself out of waist deep snow it was time for a well-earned break and to plan our next lift. We made our way back to the Peak 2 Peak lift and from there made our own routes down to Creek-side, for what turned out to be the best and biggest bowl of pulled pork nachos I have ever seen! 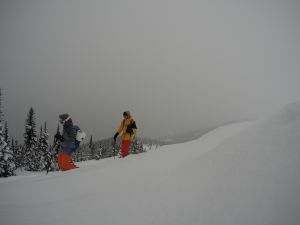 Thursday we went out into the back country with Coast Mountain Guides. We met our guide, J.F at the bottom of the Whistler gondola with nervous anticipation. 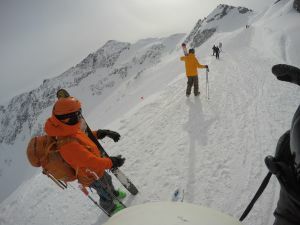 We talked through the avalanche safety gear and created a plan for the day. 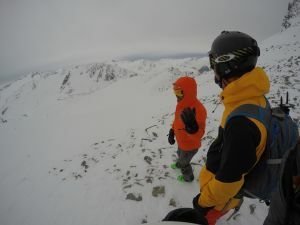 Coast Mountain Guides was started by Guillaume Otis with his Dad back in 1998. 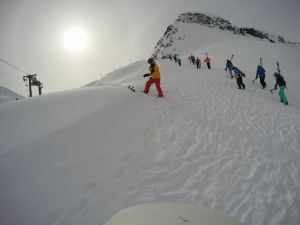 They operate all year round and provide mountain guiding services for a wide range of client’s skills and abilities. 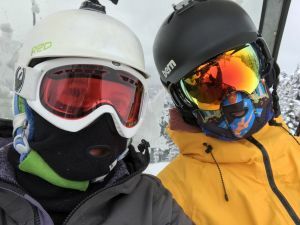 We took the lift up to the top of Blackcomb Mountain, to get into the glacier bowl we had to use the toggle lift, which I expertly fell off twice! We started to traverse the glacier ridge on foot it was absolutely stunning, in every direction mountains towered over us gleaming in the morning sun. 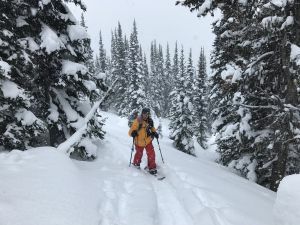 After a short run down we entered the back country gate, making sure our transponder’s where working as we passed through, we left the lifts behind and walked into Mother Nature’s playground. Martyn and I had never been back country before or walked up a glacier for that matter, so a brief lesson on how to split our board in two and then how to add the skins (sticky pads which ran along the length of each ski), so that we could climb the mountain. It was an odd feeling after being on a board to split it in half to use as skis it was easy to do once you got the hang of it. We started the traverse to the summit. Using the ski tracks of the people that had been before we slowly zig-zagged up the side of the mountain not dissimilar to the way you would mountain bike up a steep hill. 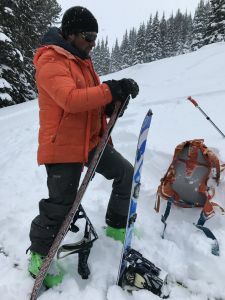 Reaching the summit, the Fitzsimmons Range stretched out before us like a scene from an action movie, the wind howled around us, whirling snow into tiny tornadoes. I felt in awe at the sheer power of the wind and the vast expanse of snow reaching out before us. Although a little chilly I felt humbled by my surroundings. 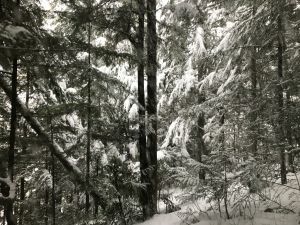 Then we were ready, with the wind thrashing around us, we swooped over the edge into pure white powder, it was like riding through whipped egg whites. The board carved through the deep snow descending quickly down the slope. Making our way to the next climb, we stopped beneath the ridge, where we had to climb in the bowl for a lunch stop with a serious view. The approaching storm shrouded the tops and the dark clouds looked ominous, our perfect visibility was about to be snatched. After a few bites it was time to split our boards, apply our skins and make our way into the cloud. It was hard, hot work climbing pushing your ski forward with your toe and the pushing down with your heel so the ski gripped the snow. At the top we used our skis to compact the snow, to make a ledge to work from, then it was time to reassemble our boards. The trees gave us shelter from the wind and we worked quickly. Stopping anywhere in high up mountains in changeable weather can be chilly work and the colder you get the slower you get. Ready to go, the visibility was making our route through the trees tricky so our guide J.F went first then I boarded down to just below him and then it was Martyn’s turn. My first tree run was good however on my second run I didn’t turn quick enough and ended up in a tree… The powder was so deep my left leg sunk out of sight and all the pulling in the world was not budging it, when I looked up all I could see was snow which was a little frightening. I shouted to Martyn who heard the slight panic in my voice and came to my rescue. It’s times like these that you appreciate the wild of the wilderness and understand the respect that should be given to outdoor sports and mother nature. Making my way down to J.F to rest, it was Martyn’s turn. 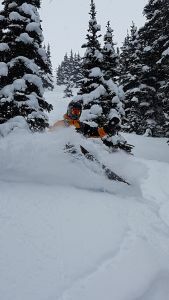 J.F had scouted a jump for Martyn who expertly carved through the fresh powder launching off a jump into the air, landing in thick, thick snow. 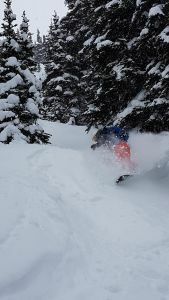 Our last backcountry run of the day was epic! The visibility had been reduced to about 15m because of the storm. It took all my concentration to work out the contours in the snow, so that I could make good turns. Once we were lower the visibility opened up as we weaved through the trees and dipped out into a long run down to Whistler village. Buzzing from our day in the back-country full of stories, memories and feeling exhausted we stopped for a well-earned drink. Being able to put your helmet and goggles inside your bag will mean they don’t fill up with snow! Mine did it was a brain freezing experience putting them back on! 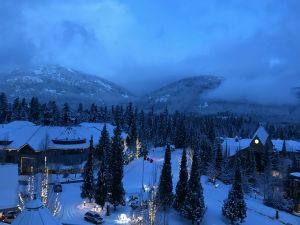 Our time in Whistler was over too quickly. We met some wonderful people and you cannot fault the Canadian hospitality, everyone is super nice and welcoming. Whister village has a great selection of outdoor shops for perusing and a buzzing après ski scene, although to be honest we spent more time on the slopes than in the bars. 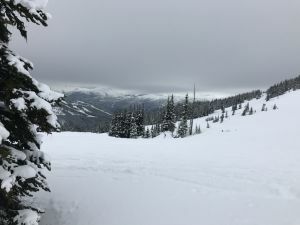 The Blackcomb side of the mountain has, in my opinion the better longer runs and on the Whistler side you have more powder and glaciers to explore. The blue runs are like red runs in Europe and the black and black diamond are more advanced. The whole area is vast and we only touched the surface on ticking off the runs. I have always loved photography and film and this year have decided to have a go at creating videos. These video’s was shot sing a Go Pro Hero 4 Black and a Go Pro Hero 4 Silver. Film lesson one was I accidentally changed the resolution on one camera so have had to make two edits! (second one to come) Had loads of footage so this was not a problem. My tip for anyone else looking to make videos would be create a story board of what you want in your video. I found it really helpful to know the type of outcome I wanted before I went out and filmed everything, Martyn and I then proceeded to film everything anyway but at least we had an idea of what we wanted to create! I would love feedback on what you think of my videos and you tube channel. If you like it please subscribe here. Thanks for watching! if you like please comment and share. Follow me on Instagram for photos from two wheeled adventures. I felt like I had been waiting ages for our snowboarding trip this year. Martyn has been checking the snow forecast for months. 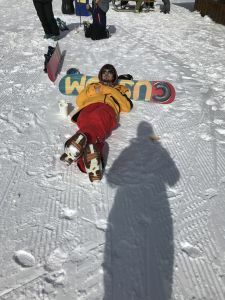 To start with the season had a dusting of snow with many runs closed but as we edged closer to March the snow angels got to work and the weekend we arrived nearly all runs were open and the peaks were covered if a fluffy blanket of powder. Thank you snow angels! Sestrière lies at the heart of the Milky Way which offers almost 400 km of pisted runs. It is an alpine village in Italy, a part of the Province of Turin. It is situated in Val Susa, 17 km from the French border, which means you get the benefit of boarding in Italy and France on your lift pass. We arrived on Sunday to blue skies, cold air and great food at our hotel the Principi de Piemonte which lies to the side of the Sestriere. Our six day lift pass started on Monday so while Martyn relaxed in the bar I decided to make the most of the spa facilities. I did Pilates followed by a swim, sauna and steam. A great way to start a holiday I think you will agree. After only 2 hours sleep on Saturday night we got an early night ready for a day of boarding on Monday. Getting ready for a day on the slopes is like a military operation, first of all you have to play a game of what fits in what pocket! It is very true about all extreme sports you don’t buy the padding until you hurt yourself. I am now the proud wearer of essential padding including impact shorts, wrist guards, knee pads and elbow pads. 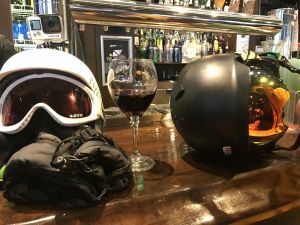 For any first timer I would recommend wrist guards, impact shorts and knee pads you will be surprised once you get used to feeling like a medieval knight how they will improve your time on the slopes as confidence grows and nasty purple bruises decline. Sitting on the slopes are chilly and impact shorts also reduce cold impact on the gluteus muscles! The first day I always feel a nervous anticipation of what’s to come we decided to stay in Sestriere and made our way gradually over to Borgatta which is the next village along one of the lifts was closed and the large queue seems like the ideal excuse for a hot chocolate and beer stop. The lift to the top chilled us both to the bone, getting off the lift the snow whipped into a frenzy by the wind swirling around making any bear skin painfully cold, we were soon on the move and warming up nicely I followed Martyn trying to match his line to make myself faster. This worked really well and I felt a new confidence and enjoyed chasing him down the mountain, at the bottom we turned and went straight up again, another bitterly cold lift to the top. I hit my top speed at 36.5 miles an hour according to the Ski Tracks app. We stopped at Du Casa for lunch which was nice and then decided to make our way back to our hotel to warm up! Arriving back at our hotel I kept my promise to myself and did Pilates and then Martyn and I went to the spa and for a swim. Dinner was again great with a buffet for starter then a pasta course, then a meat course and then a buffet of puddings, for the second night in a row we rolled back to our room too full! On Wednesday we went on a coach trip to Montgenerve in France it’s a pretty, quiet French town with a load of great slopes for everyone. There are a few greens which can be hard for boarders, but most of the runs are long blues and reds. The best way to start is on the right hand side where the gondola takes you up half way before changing to a chair lift them from the top take the red, blue routes down to the far left of the gondola where you will cross the road and end up at the Tremplin lift, here you can then go up and explore the left hand side of the mountain. The left hand side has a lot more to offer I terms of runs but the right hand side has some great open off-piste sections perfect for beginners as you can see the runs below and head towards them if you get really stuck. On the left hand side you can go up to the Crows Nest. This is the place where you can cross over back into Italy and ski back however it involves three lifts one after the other so ideally get a coach or taxi to France so you can enjoy the great runs. From the Crows Nest there are some brilliant long red routes which take you onto blues and then back down to the Tremplin lift these are great fun wide reds with stunning 360 views. View from the Crows Nest. There are less places to eat in France, most people eat in Montgenevre. We ate on the mountain, on the right hand side of the road with a stunning view and reasonable priced good food. It’s worth carrying a bottle of water as with the food places being sparse it’s harder to get a drink too, on hot days your need to replace your fluid. France is well worth a visit the runs are fantastic, the off-piste is vast and for those more experienced boarders there is wide open spaces to explore. For those who love gliding down the mountain there are plenty of long green and blue runs which including breathtaking views. I find France slightly harder to navigate Montgenevre has a few runs packed tightly together and then the rest is spread out so it’s easy to accidentally take a wrong turn, where as in Sestriere most of the runs have clear starts and finishes. On Thursday we went over to Sauze D’oulx the runs over this side are longer and quite wide which is confidence boosting for beginners. A lot of the runs lead to a massive bowl where there are loads of restaurants. The bottom run into Sauze was a bit slushy as this resort is lower than Sestriere. We made our way back to Sestriere for the afternoon and played off-piste next to our hotel, my off-piste ability is improving, although I still spend a lot of time digging myself out of the snow – part of the fun! We were woken by the sound of a helicopter taking people heli ski-ing, a good indication of another great weather day. 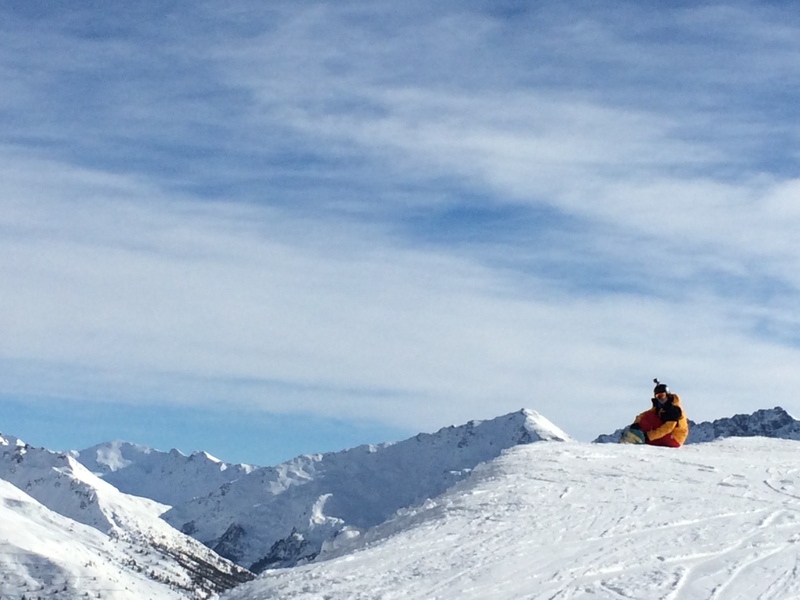 We took the gondola up into Sauze but this time went down to San Cicaro on the way to France. I felt really confident and enjoyed the black, red combination. Around this area there is also some long red runs through the trees, which are a bit skinny in places and for a boarder you need to carry speed to get up some of the inclines. As with Sauze the sun made the bottom parts of the runs a bit slushy so after a burger stop we made our way back over to Sestriere. From this side you have two choices either a toggle lift to the top gondola or a red/ blue run to the mid station. From the mid station you can either get the gondola or there is a flat long blue run through the trees which takes you back to Borgata. 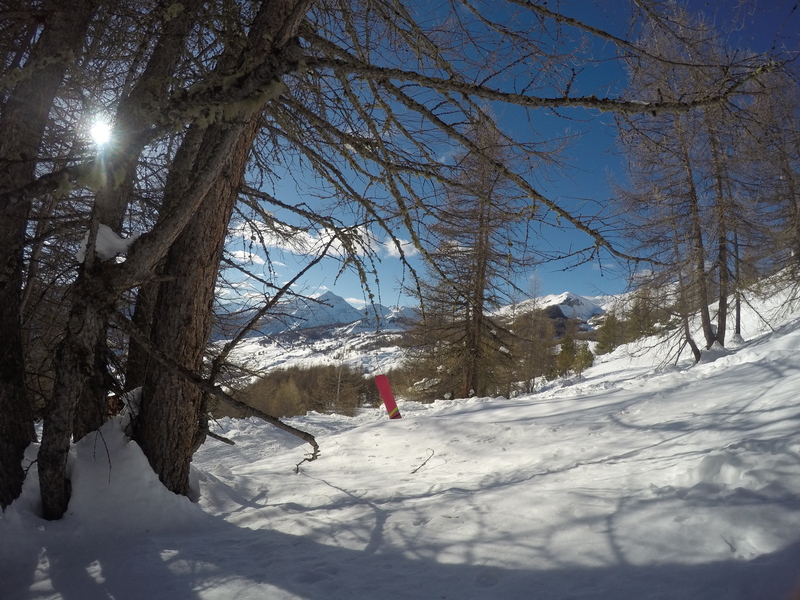 We went for the blue option and then went off-piste, it was hard work at the top through lots of pine trees but soon it opened out into untouched snow we headed down to the back of Sestriere and then walked through town which was exhausting but the off-piste made it well worth it! After a hot chocolate and beer stop we got on the lift in Sestriere back to the top of the blue and went off-piste all the way your hotel, I found it easier this time twisting through trees and only getting stuck once or twice! Our last day came too quick! We decided to spend the whole day off- piste, as I was improving, this turned into the best day of the holiday by far. We took the gondola up to the top of Sauze, as we got higher I felt the butterflies in my stomach rising in anticipation for what was to come. We walked around the lift and literally slid off the edge it was quite steep and the snow crunched under my board where the top layer had frozen. This off-piste was quite well worn but it was still amazing to be the only two on the slope, we made our way onto the long blue descent and then again popped over the edge into the trees, the conifers were tightly packed and I did my best to follow Martyn’s expert line through them, my skill level is not quite as good and I found myself sitting amongst the branches on more than one occasion! We found a great little cake and drink stop overlooking Sestriere and the mountains beyond, from there we made our way into the clearing a vast space of pure white snow where no one had been I loved the feeling of making my own tracks and the complete freedom of being able to go where ever I wanted. We headed down to the back of the hotels using our boards as sledges, before walking the rest of the way. After picking up some lunch supplies we headed back up on the gondola, Martyn casually said “let’s stop on those rocks for lunch” I wasn’t so keen on the idea of lunch on the edge of a rock but once we got to our lunch spot I changed my mind. 360 mountain views, peace and quiet, our own spot on the top of the world. Bliss. After lunch we slid off the other side of our rocky outcrop carving our own trail into the mountain side back into Sestriere. Stopping at the bottom for a well-earned hot chocolate and beer we planned our next descent. 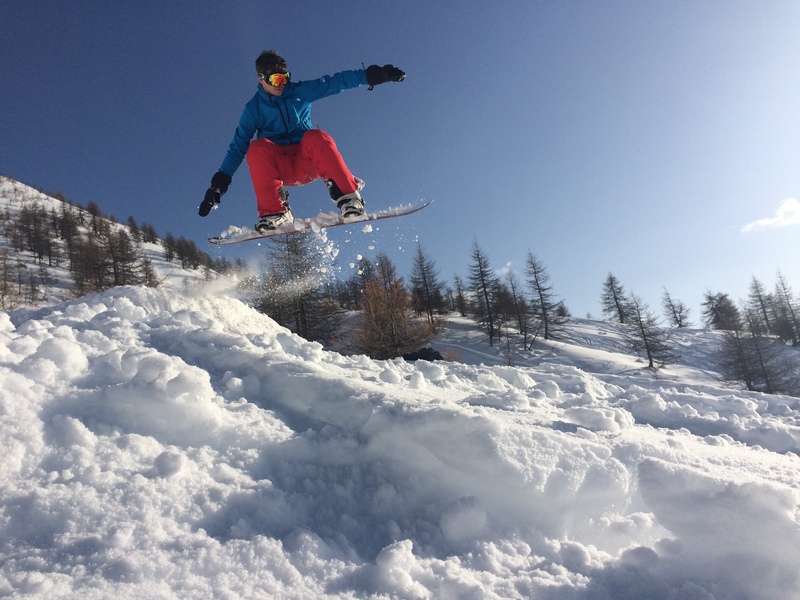 The plan was to go off-piste from the Sestriere to find a place to build a little jump, I had never done any jumps before so was excited about trying something new. Once off-piste we looked for a spot where we could build a jump, Martyn found the ideal area with a good run off and a nice soft landing. Once we had built the jump (which was hard work) Martyn showed me how it was done and then we took it in turns. My biggest issue seemed to be staying pointing down the hill! The landing was soft and I was soon making a little progress getting air even if I did land on my bum most of the time! As the sun started to dip in the sky and the last lift of the day had stopped behind us, we decided sadly, we better leave our snowy paradise and made our way back through the trees to our hotel. 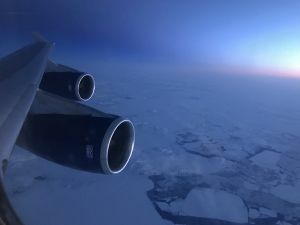 After what seemed like the longest journey ever, we touched down in Borgata outside the Banchetta hotel, weary from a day spent in Gatwick having missed our flight due to a communication blunder by our travel company. We were delighted to have not missed dinner and tucked into hot soup and bread before getting an early night ready for our first day on the slopes. We woke early with excitement ready for the day ahead. From our hotel we could walk to the lift and had planned to check out the piste in Sestriere before planning the two weeks boarding ahead of us. Martyn is a very confident snowboarder and was buzzing to get to the highest point and see how quickly he could make it to the bottom. After dislocating my arm last year I was a bit apprehensive and nervous, I had however brought elbow pads to help give me a confidence boost! Having not been on my board since hurting my arm, the butterflies continued to rise and intensify closer to the top of the chair lift. 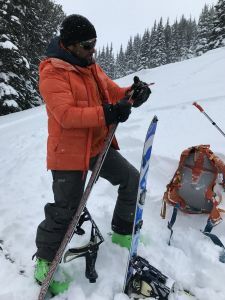 Deposited at the top of the slope I eagerly strapped in my feet and edged close to the edge of the slope, I gingerly started my descent getting into the rhythm of toe edge, flat, heel edge, flat. I crept down the slope watching others, including Martyn, hurtle past at a lightning speed. At the bottom I breathed a sigh of relief at getting down my first run, and by the end of the first day I was back in the swing of things. 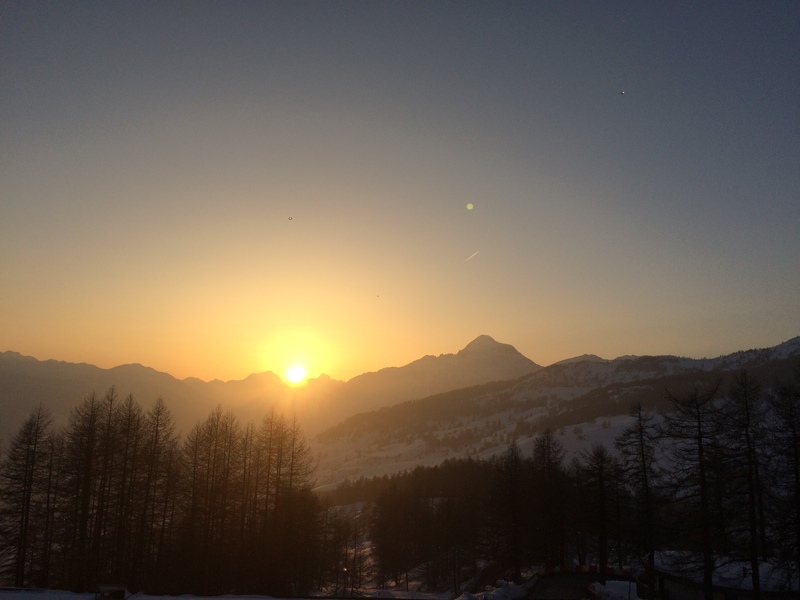 The sun rose brightly on Monday and we headed over to the gondola to go to the other side of the mountain into Sauze d’oulx. As we reached the top the view was incredible, stretching in every direction were white peaks set against a beautiful blue sky. The beauty and exposure when you’re standing on top of a mountain is breath taking, there is no feeling quite like it. Heading down the slope I encountered my first flat bit of road, the same type of surface where I hurt my arm. 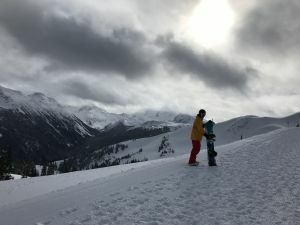 A feeling of dread resurfaced which I tried to push to the back of my mind and focused on my turns, but found myself skating down on one edge which sent burning sensations down my hamstrings. Tired from my mini panic and extra adrenalin I was relieved to stop for a hot chocolate! The rest of the day went smoothly and I soon learnt to relax on the roads looking ahead instead of at the drops off the side when they became narrow. The next morning the fog had rolled in and the sky was releasing a soft flowing stream of snow. For the next three days the snow was relentless, a never ending flurry of white stuff. It was a surreal feeling to take a chair lift up through the snow covered trees and see the deep snow drifts. Snowboarding in the fog is a bizzar experience, when you can’t see more than 5 metres in front of you and the sky and ground both appear in a white haze. It makes differentiating lumps and bumps almost impossible. At this point you realise how reliant you are on sight as a sense and that without it you feel very lost. This is when you have to tell yourself to relax, if you stiffen up every bump lands you on your bum! Relaxing and letting the board move beneath me I soon got into the flow of things and started to enjoy my white out experience. Everything is so still and you can hear so much more it’s like your ears become hyper sensitive to the sound of the crunchy piste or cracks of ice and the sound of others around you. When the skies cleared and the sun came out to play the scenery was remarkable. Everything was coated in a white vale and we immediately went off –piste to enjoy the newly fallen snow. I followed Martyn straight off the side of a run and ran straight into waist deep snow! However hard I tried I didn’t seem to be able to dig my way out, so ended up taking my board off my feet, digging it out and walked to a clearing. Once the piste bashers had groomed the slopes I felt a weird sense of un-easiness as I could now see how steep the slopes were and every lump I had in my path ahead. 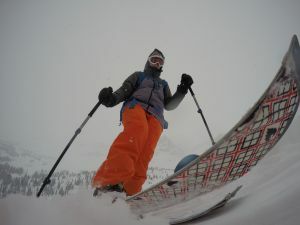 It was funny to think when the visibility had been awful I had completely trusted my skill level and felt my own way down the slopes, but now my eyes were looking down I wasn’t convinced I could do runs that I had done when I hadn’t been able to see anything! After another few days of more snow falling and lots of great days boarding we felt like a change of pace and mode of transport so Martyn and I booked a trip of Husky dog sledding. I was expecting this to be a fun and less tiring activity, how wrong I was! My team of three Huskys Jack, Annie and Toffee were eager to pull the sled as we set off on our mini adventure. They worked well and listened to my commands of ‘Okay!’ meaning Go, ‘Woah’ meaning stop and ‘Easy’ meaning, well take it easy! However whenever the slope turned uphill they found a new game to play, this was called “role in the snow and sit down and let Hannah do all the hard work pushing the sled” I suppose they felt that after pulling me down the hill it was only fair I did some of the work. 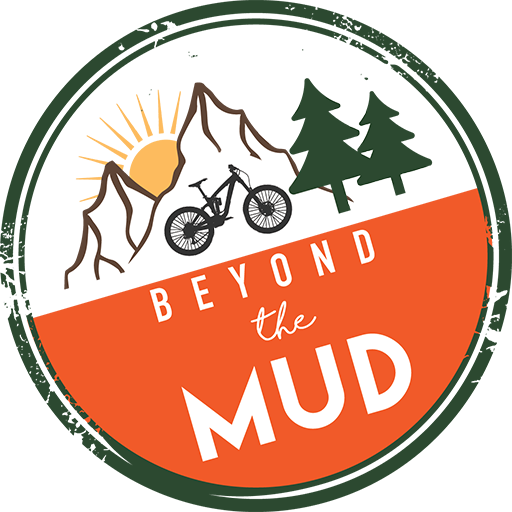 Despite it being not the rest day we had anticipated it was great fund and a brilliant experience and one I would recommend! That afternoon it was back to boarding and Martyn, who was teaching himself to ride switch and 360 taught me to 180 something I am still working on! The Milky Way ski area which is vast and covers 400 kilometres and straddles the Italian-French border. The resorts are staggered at very different altitudes, from Cesana at 1350m to Sestriere at 2035m meters. Sestriere is the highest resort in the Milky Way with some of the most difficult terrain, we spent a lot of time here and Sauze d’oulx where the runs were longer than in Sestriere and had a flowing feel to them which we both enjoyed. We spent our last day in Montegenvre (1850m) over the border in France the runs here were steep and small but the scenery was beautiful and it was great fun weaving across the mountains through Italy and France for the day. Two weeks in the snow covered mountains was awesome. I had pushed myself outside my comfort zone when the going got tough. I felt like a tiny ant in a very big world standing at 2035m, I felt exhilarated and a little scared on my first black run when it seemed like I was free falling through the air, but it all added to the satisfaction and self fulfilment of snowboarding. There is something special about being in the mountains which makes you feel more alive. They are a place of beauty and adventure a place where you can feel free and live life to the full.